The one to the left is a GE, the other two are TCP. When the HPS lamps leaks, it creates a cool mirror effect, or simply creates a black coat. 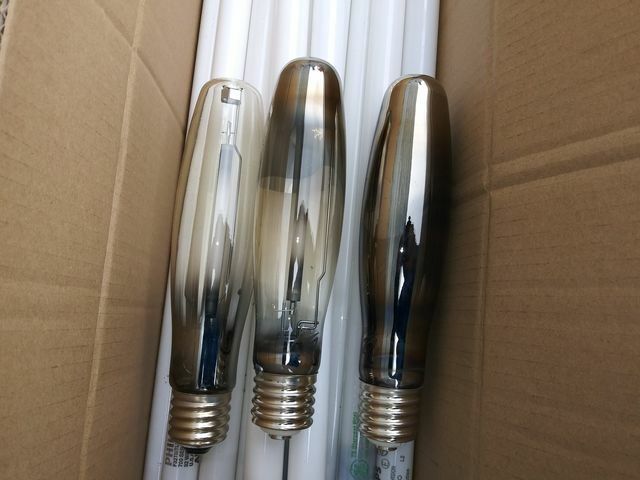 The left leaked lamps looks very similar to some lamp with a coat as reflector, generally the MV and MH lamps. So MANY long hours on those lamps!!! !I have a couple of HPS bulbs sort of like that and they still work-but not at new lamp brightness.Hold a tesla coil-portable one for testing neon signs you see the gas glow inside the outer bulb.